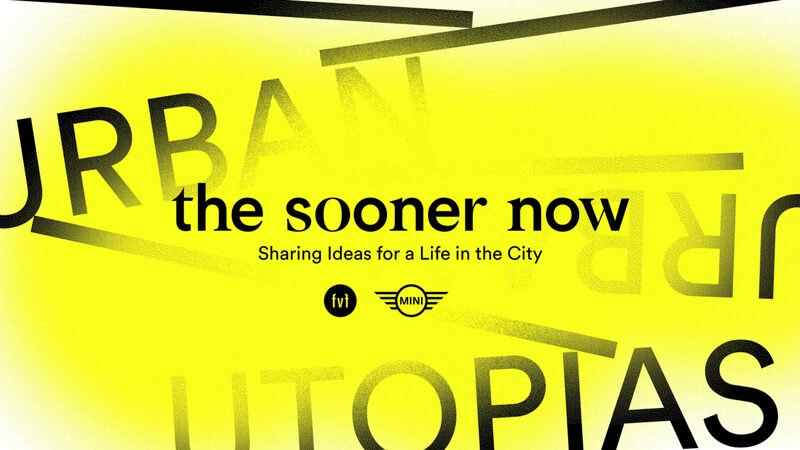 The Sooner Now is a joint initiative by FvF and MINI fostering collective imaginations of urban futures. For a long time, the future seemed to be a far-flung fantasy. Whether flying around the world, landing on the moon, making a phone call from Sydney to Berlin or working remotely from Tuscany, these “futures” are now the present. Even though we widely profit from such innovations, many sectors remain faced with extreme challenges. Cities are bursting out of their old structures, and its implications are ubiquitously noticeable in everyday urban life. Everything that we do today has an effect on our future and the futures of our cities. This implies a sense of shared responsibility within the community concerning our everyday decisions. The Sooner Now is an initiative by FvF and MINI that seeks to further discussion and foster thinking about the future of our cities. We focus on the personal, the small scale, the creative use of space, and raising awareness for these new and innovative possibilities. We have teamed up with MINI to create visibility for inclusive ideas which consider the quality of life for all urban dwellers. As MINI has shown interest in the future of urban living since its foundation in 1959, our ongoing partnership is a natural fit. United by a shared curiosity to understand, map and form urban living, The Sooner Now was created in 2016 as an ongoing exchange of inspiration. To be continued in 2019: we’re currently working to take The Sooner Now even further in the new year. To receive all upcoming announcements, sign up to FvF’s bi-weekly newsletter. Want to see your project featured? Get in touch and tell us all about it!